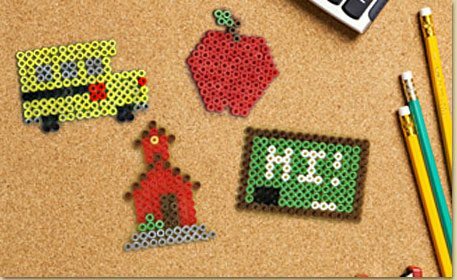 Use Melty Beads and the pegboard shapes shown to create a School bus, Schoolhouse, Apple and Chalkboard and get excited to head back to school! Tip: Remember, what you see on the pegboard is actually the back of your Melty Bead craft. When spelling words, do them backwards as shown!